28 January 2015, at 12:00a.m. Poultry industry analyst, Terry Evans, explores the trends in chicken meat consumption in the Americas. Global population growth is slowing and, according to USDA economists, is likely to average around one per cent per year between 2013 and 2023, which compares with 1.2 per cent in the previous decade. Growth rates in most developing countries will remain above the rest of the world hence, by 2023, developing countries will represent 82 per cent of the world’s population compared with 79 per cent in 2000. In 2000, the Americas accounted for some 13.7 per cent of the population (Table 1) but this proportion declines just a little by 2030 when the total for the region is reckoned to amount to 1.1 billion out of a global figure of some 8.4 billion. Between 2013 and 2023, global economic growth is assessed to average 3.2 per cent per year, being relatively weak in developed countries and stronger in developing nations. World meat consumption, according to OECD and FAO projections is expected to average 36.3kg in retail weight by 2023, an increase of 2.4kg compared with 2013. Some 72 per cent of the increased consumption will come from poultry. Although consumption growth in developed countries will be slower than in developing countries, average uptake by 2023 at 69kg per person will remain more than double that in developing countries. Increases in poultry consumption are primarily linked to four key factors namely population growth, improvements in incomes, chicken prices relative to those for competitive meats and dietary preferences. 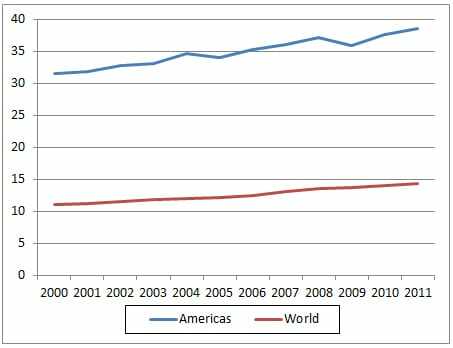 Global poultry meat uptake is forecast to increase by 1.7kg per person from around 13.2kg to in 2013 to 14.9kg in 2023. These retail weight figures are equivalent to around 88 per cent of the eviscerated or ready-to-cook weight. Thus, for 2013 poultry uptake was around 15kg per person on a ready-to-cook or eviscerated weight basis, while the equivalent estimate for 2023 will be almost 17kg. Consumption data compiled by the FAO reveal that global poultry meat uptake has increased from 11kg per person in 2000 to a record 14.4kg in 2011 (Table 1) on an eviscerated or ready-to- cook weight basis, during which time the average uptake in the Americas rose from 31.5kg to a new 'high' of 38.6kg (Table 1 and Figure 1). At the outset it must be appreciated that the figures relate to estimates of the quantities available to be consumed and are not a direct measure of the actual quantities eaten. The individual country data regarding human population and poultry consumption are presented in Table 2. Total poultry meat consumption in the United States in 2013 was assessed in a World Agricultural Supply and Demand Estimates report at 99.2lb (45kg) though somewhat confusingly the broiler part of this figure was assessed on a retail weight basis, while that for turkeys was on a ready-to-cook basis. Broiler uptake was put at 81.9lb (37.2kg) retail weight. For 2015, consumption in the USA is expected to average 85.3lb (38.7kg retail or 45kg ready-to-cook), while the long-term forecast to 2023 is currently put at 43kg retail or 50kg ready-to-cook. Regarding chicken meat consumption the retail weight is considered to be 86 per cent of the ready-to-cook weight. During the economic recession, total meat consumption in America contracted by nine per cent although for poultry, the cut-back was nearer six per cent. Broiler uptake slipped from 85.2lb (38.7kg) in 2007 to 80.4lb (36.5kg) retail in 2012. Since then, the US economy has turned the corner and broiler consumption has recovered to the current level of around 85lb (38.6kg). While improvements in incomes are the prime factor in this recovery, a reduction in production costs reflected to a certain extent at retail level, has also proved a positive stimulus to demand. Broiler meat consumption in Brazil is forecast by a USDA GAIN Report to expand by some two per cent this year, which would be reflected in a more than one per cent rise in per-person uptake to possibly 45.6kg. However, there is concern as to how the high level of indebtedness among consumers, high inflation and greater competition from other meats, primarily beef, might dampen the anticipated increase in domestic broiler uptake. Estimates of broiler consumption in Mexico in 2015 show some variation but, in broad terms, it seems likely to be in the region of 3.9 million tonnes. According to the National Poultry Union (UNA), per-capita uptake will see sustained growth this year, primarily because of the chicken price advantage, from the 25.5kg of 2014 and 25.1kg in 2013. Broiler consumption in Argentina has almost doubled over the past decade from 22kg to 41kg per person. Estimates for 2015 show no change in average uptake, which might indicate that the domestic market for chicken could be close to a saturation point under the influence of moderating beef prices. Broiler supplies in Canada are regulated by a supply management scheme on domestic output and a tariff rate quota which is applied to imports. The market is also considered to be close to saturation and according to a USDA GaIN Report, further increases in total uptake would appear to be dependent upon population increases and by the ethnic composition of Canada’s immigrants as many of Asian or African origin have a preference for chicken over other meats. Uptake in Peru is considered to average 34.3 kg per person in 2014, with a forecast for 2020 of 36.3kg.